Cancellation Policy: Should you need to change or cancel the reservation, you must do so by 4pm local hotel time, 48 hours prior to the check-in date. If the reservation is cancelled within the 48 hour time frame, the card on file will be charged 100% of the room rate plus all applicable taxes. Complimentary Continental Breakfast: Enjoy our complimentary Continental Breakfast every morning from 7am-10am. The New York Times & The Wall Street Journal are available at breakfast! Forget Something? Additional complimentary toiletries are available upon request, and include: razors, shaving cream, toothbrushes, toothpaste, shower caps, sewing kits, soap and lotion. Dry Cleaning: For same day service, drop off your dry cleaning at the Front Desk by 8am. The guest will be responsible for this additional cost and payment. Housekeeping: If needed, extra pillows, blankets and bedding are available by calling the front desk! Luggage Assistance/Storage: Luggage assistance is available for all guests. The Peacock Inn is not liable for the luggage or its content. Wake-Up Calls: You can request and schedule a wake-up call by calling the front desk! Raining Outside? Should you require an umbrella during your stay, one may be found in your room. Kindly leave it in the room prior to checking out. A $25 charge will be added to your bill should the umbrella not be returned. The Peacock Inn is non-pet friendly hotel. Guests that bring a pet into their accommodation will be subject to an additional fee of $250 per stay. The Peacock Inn is a non-smoking facility. Please be considerate to all of our guests and do not smoke inside the building. 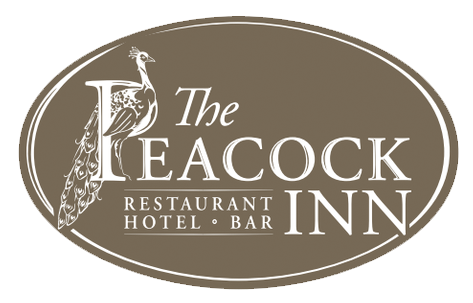 If you are found smoking or have smoked inside The Peacock Inn, a fee of $250.00 will be charged to your account. Thank you!